Today’s update includes a brief explanation of recent trade tariff action taken by the U.S. and China. The trade uncertainty unfolds as agricultural producers anticipate another year of stagnant farm income, and while robust production of corn and soybeans in recent years has made exports an important component of demand. Overall, USDA has noted that agricultural exports account for 20 percent of U.S. farm income. Meanwhile, President Trump has instructed Secretary of Agriculture Sonny Perdue to “implement a plan to protect our farmers and agricultural interests” as the trade tussle continues. Recall that on March 22nd, President Trump announced a plan to impose $50 billion worth of tariffs on Chinese imports. On April 2nd, in response to steel and alumuimn tariffs imposed by the U.S. on March 8th, China imposed tariffs of up to 25 percent on U.S. imports- including pork and ethanol. On April 3rd, the United States formally proposed tariffs on $50 billion of Chinese goods. Then, on April 4th, China proposed $50 billion of tariffs on U.S. imports, including a proposed measure to levy retaliatory tariffs of 25 percent on agricultural products including: soybeans, corn and corn products, wheat, sorghum, cotton, beef and beef products. In another signal that Mr Trump was preparing for a long trade battle with Beijing, he said he had instructed his agriculture secretary to ‘implement a plan to protect our farmers and agricultural interests‘ from Chinese retaliation. Damian Paletta, Heather Long and Emily Rauhala reported on the front page of Saturday’s Washington Post that, “The United States and China dug in for a protracted trade war Friday, with the Chinese government saying it would ‘fight at any cost‘ President Trump’s threat to slap new tariffs on $100 billion in Chinese goods. 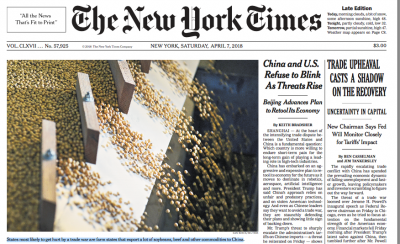 The front page of Saturday’s New York Times included a photograph of soybeans, with the caption: “States most likely to get hurt by a trade war are from farm states that export a lot of soybeans, beef and other other commodities to China.” Illinois leads the U.S. in soybean production. Bryce Gray reported on Wednesday at the St. Louis Post-Dispatch Online, “Illinois is the country’s largest producer of soybeans and fourth-largest source of pork, according to the USDA. The latest agency numbers show that the state has the third-highest value of agricultural exports, totaling more than $8.3 billion in 2016. And, Washington Post writer Caitlin Dewey reported on Thursday, “Like most large-scale soybean farms in the United States, [fifth-generation Ohio farmer Bret Davis’s] business relies heavily on foreign markets. China buys 60 percent of all U.S. soybean exports to feed a growing fleet of hogs, fish and chicken. Long term, the prospects are even worse. Although soybean prices rallied Thursday morning, they were still down more than 20 cents. And even if prices stabilize, tariffs will erode farmers’ Chinese market share, said Wallace Tyner, a Purdue University economist who has modeled the likely effect of the tariffs. Within three to five years, Tyner’s model shows, Brazil and Argentina would replace the United States as China’s main source of soybeans. That could force U.S. farmers to switch to less lucrative crops, such as corn or wheat. Politico writers Adam Behsudi, Catherine Boudreau, and Doug Palmer reported on Friday, “Brian Duncan, who raises hogs and cattle and grows row crops in Ogle County, Illinois, and is vice president of the state’s Farm Bureau, told POLITICO that while he appreciates the president acknowledging that agricultural producers are going to take a hit, he is skeptical of the assistance being promised. Greg Kocher reported on Friday at the Lexington (Ky.) Herald-Leader Online that, “American farmers will not be ‘the tip of the spear’ in the escalating trade war between the United States and China, Agriculture Secretary Sonny Perdue said Friday in a visit to Kentucky. More comments from Sec. Perdue can be heard in this USDA radio clip from Friday (MP3- 1 minute). However, farmdoc’s Jonathan Coppess indicated last week that USDA’s administrative latitude to take action in this situation might be limited (see video clip below). Reuters news reported Thursday that, “The U.S. Department of Agriculture (USDA) is looking to find ways to shield farmers from the growing trade conflict between the United States and China, a department official said Thursday evening, without providing details of options under review. I contacted @SecretarySonny to urge him to use every tool in the Farm Bill, including Commodity Credit Corp programs, to protect ag producers from effects resulting in potential trade actions against China. Farmers must know the Admin has their back & I urge them to act swiftly. Mr. Polansek explained, “It is unclear what types of options exist to protect the sector, though expectations were that the omnibus farm bill, the U.S. government’s main food and agricultural policy tool, could include crop insurance and potentially other subsidies that could address the concerns. That bill is up for renewal this year. “‘This is not a good situation. It just isn’t,’ said U.S. Senator Pat Roberts, a Kansas Republican who heads the Senate Agriculture Committee. And, an Omaha World-Herald article from Thursday stated, “Ted McKinney, undersecretary of agriculture for trade and foreign agricultural affairs, said he understands concerns about tariffs coming at a time when many farmers are struggling with low commodity prices. And he asked people for patience, saying U.S. Department of Agriculture officials are working to ensure that farmers will be protected in the escalating trade conflict with China.